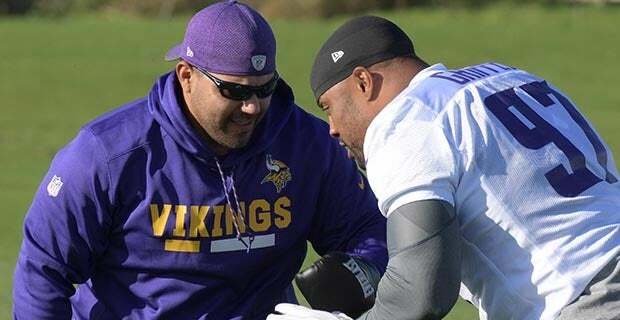 Robert Rodriguez completed for his 3rd season with the Vikings in 2018, and served as the team’s assistant defensive line coach. 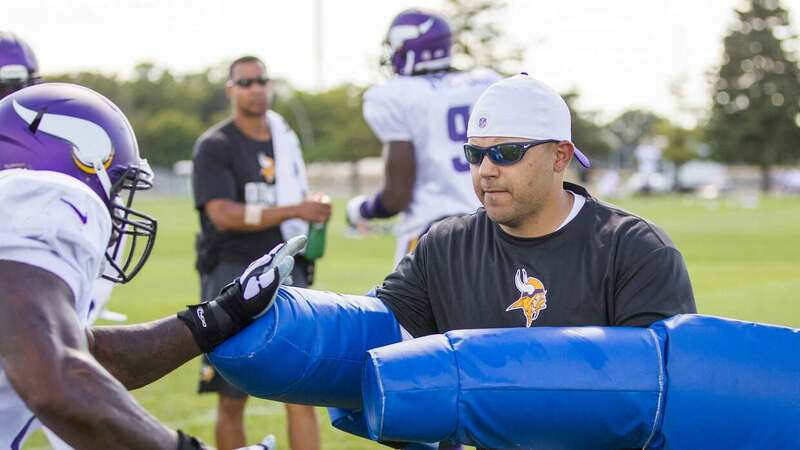 Rodriguez hasl again worked closely with veteran defensive line coach Andre Patterson. In 2018, Rodriguez helped the Vikings defense that ranked #4 in Total Defense, #3 in Pass Defense, #3 in QB Sacks, and #1 in Adjusted Sack Rate by FootballOutsiders. In 2017, the Vikings ranked #1 in the NFL in Scoring Defense, #1 in Total Defense, #1 in 3rd Down Defense, #2 in Rushing Defense, and #2 in Pass Defense. The Vikings won the NFC North and advanced to the NFC Championship game before falling to the Phildelphia Eagles. The Vikings defense ascended to #3 in the NFL in 2016, powered by strong and consistent play along the line. The Vikings ranked tied for 4th in the NFL with 41 team sacks, 34 of those coming from the defensive line, which was the 2nd-most as a unit in the NFL. The d-line was represented at the Pro Bowl by DE Everson Griffen (2nd honor) and DT Linval Joseph made his 1st appearance. Joseph notched 100 tackles on the season and 2nd-year player Danielle Hunter led the club with 12.5 sacks putting him in a tie for 3rd in the NFL. The Vikings defensive line accounted for 2 TDs and a safety with Hunter returning a fumble for a TD and notching the safety and Griffen returning a fumble for a score. Griffen was named NFC Defensive Player of the Week for his game at Carolina (9/25) when he had a season-high 3.0 sacks. Everson Griffen led the team with 10.5 sacks (4th in NFC) on his way to his 1st career Pro Bowl. Griffen posted back-to-back seasons with double-digit sacks and ranks 6th in the NFL with 22.5 sacks since the start of the 2014 season. 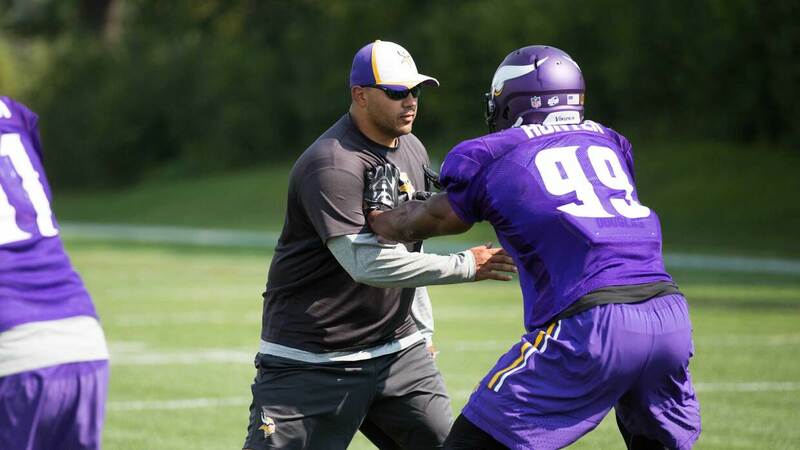 Spelling Griffen and veteran DE Brian Robison (5.0 sacks) was Danielle Hunter, the youngest player in the NFL. Hunter, a 3rd-round selection out of LSU, ranked 2nd in the NFL for sacks by a rookie with 6.0. He posted the 2nd-most sacks on the Vikings and 5th-most by a rookie in team history. NT Linval Joseph was a dominant force in his 2nd year as a Viking, and he led the DL with 71 tackles. Joseph (Week 9 vs. STL) and Griffen (Week 17 at GB) earned NFC Defensive Player of the Week honors. Hunter was named to the All-Rookie team by the PFWA. DT Tom Johnson continued to flourish in Minnesota and added 5.5 sacks. Since 2014, Johnson ranks 6th in the NFL in sacks by a DT with 12.0. 3rd year starting DT Sharrif Floyd added 2.5 sacks and 37 tackles. The DL accounted for 30 of the 43 team sacks during the regular season. Only 5 RBs reached 100+ rushing yards in 2015. The defense ranked 5th in the NFL only allowing 19.3 points per game. One of the greatest linebackers in UTEP history, Rodriguez coached at his alma mater from 2008-2014. Following his professional playing career, in his first season as a full-time assistant coach at UTEP, he coached four of the Miners’ top 7 tacklers. He coached the linebackers from 2010-12, before moving to Nickelbacks & Safeties coach and assistant Special Teams coordinator in 2013. In 2014, his DB's helped the Miners rank 15th in the nation, 1st in C-USA in Passing Yards Allowed; while his work with the special teams helped the Kickoff Coverage unit rank 10th in the nation. The Miners' top two tacklers in 2013 were both freshman safeties coached by Rodriguez. On special teams, Autrey Golden sparked UTEP's effort in 2013, averaging 27.6 yards per kickoff return to rank 10th nationally. He tied for second in the country in kickoff returns for touchdowns (two) and is already UTEP's career leader in that category. 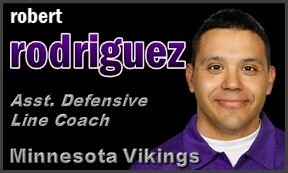 In 2012, Rodriguez's unit excelled. Josh Fely paced the team in total tackles (112), becoming the first Miner to reach triple digits since 2009. Fely's efforts were worthy of honorable mention All-Conference USA accolades. During the 2011 season Rodriguez worked with Jeremy Springer, who began his UTEP career as a quarterback and ended it as the team's leading tackler (70 stops). The Miners also received a highly productive year from Isaiah Carter (54 takedowns)under Rodriguez's tutelage, who garnered honorable mention All-Conference USA honors for the second year in a row. In his first year as a full-time assistant, Rodriguez coached four of the Miners' top seven tacklers, as Jamie Irving (79), Carter (75), Royzell Smith (72) and Anthony Morrow (67) combined for 293 stops. 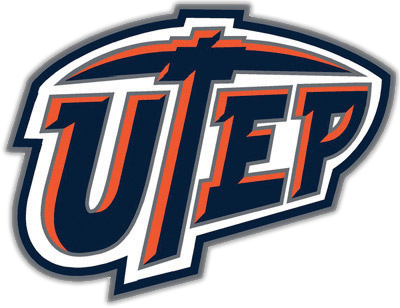 He completed his bachelor's degree at UTEP in 1994. Born December 25, 1981 in El Paso, Rodriguez is married to the former Holly Taylor, who played soccer for the Miners from 2000-03 and is currently an El Paso attorney.